Alternative remedies for treating and preventing cancer are not new. Natural remedies appeared in pill form as early as the turn of the last century. However, after Max Gerson published his “A Cancer Therapy” in the 1950s a growing interest in natural healing emerged. Near identical to Hippocrates’ four humors, the theory contends that an imbalance within the body exists that alternative medicines correct. Patients have been found to choose complementary and alternative medicine (CAM) after a cancer diagnosis because they perceive the unconventional treatment to be less harmful or for some reason do not trust their physician’s recommendation.1 Although they are perceived as natural, CAM can lead to harm. Serious side effects are possible.Here we present a case of a patient who chose to pursue alternative self-treatment with black salve for an atypical fibroxanthoma (AFX) instead of conventional therapy. This led to a poor outcome. It is reported here to foster discussion on inquiring about conventional and alternative medicine during preoperative consultations. A 78-year old man presented with an 8-week history of a 0.7 x 0.5 to the size and location, wide local excision and a CT scan to rule out bony involvement were discussed. No lymphadenopathy was present on examination. Given it was a primary tumor without any high-risk features clinically or histologically, adjuvant radiation was not advised. He was referred to a Head and Neck surgeon for management. In the interval time, he began applying black salve to the tumor and surrounding scalp. In place of the previous site was a well-demarcated ulcer with overlying necrotic grey-white slough, ragged borders, and peripheral erythema. Anterior focal heme-crusted erosions with a linear extension at the most anterior aspect of the wound was also present. Stippled black chemical staining was observed. There were no nodular areas within the wound and no lymphadenopathy was present (Figure 1B). He was advised to stop using this preparation. At the time of consultation with Head and Neck surgery and despite stopping the black salve, the ulcer enlarged to 20 cm in size. His ulcer was full-thickness to the calvarium. The wound was deeply necrotic and stained (Figure 1C). The wound appeared infected with associated purulence. This prompted a hospital admission for wound care, pain, management, and infection control. He was stabilized and was then referred to the burn wound reconstruction team at a neighboring hospital. 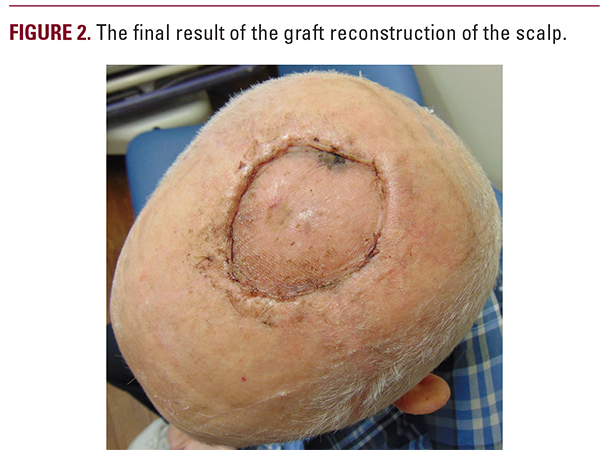 Over the course of 3 months, he underwent three graft reconstructions of his scalp (Figure 2). Black salve has been touted as an alternative treatment for skin cancer. It contains inert ingredients along with corrosive bloodroot (S. canadensis) or zinc chloride. Some formulations contain dimethyl sulfoxide (DMSO) for increased epidermal penetration. Bloodroot contains indiscriminate cyotoxic and antiproliferative plant alkaloids. In vitro studies have shown both equal targeting of cancer cells and keratinocytes as well as excess cytotoxicity against fibroblasts with inferiority in treating cancer compared to traditional treatment. Zinc chloride and other plant derivatives within the salve may contribute to cell necrosis as they have similar cytotoxicity. Consequently, this broad-spectrum action of black salve against normal human cells has led to burns and severe morbidity.2In our case, though the resultant burn may have successfully cleared his AFX, it is not possible to know for certain. Fortunately, AFXs have low metastatic potential (2.5% of cases) with a high survival rate overall. Still, recurrences happen in 7.5% of all cases within two years and spontaneous regression of AFXs is rarely reported.3,4 Our patient will require close follow-up and consideration of surgery to ensure tumor clearance. Yet, his poor outcome may have been avoided through an opportunity to discuss his beliefs.From a patient care perspective, the choice of our patient to treat himself with black salve occurred without our knowledge. This led to an adverse event. Due to the small tumor size, CAM was not considered in his evaluation. However, strong beliefs in natural treatment or fears regarding treatment may have led to its use. As a result of this case, it is clear that communication regarding the use of CAM within the overall treatment plan is a key consideration. Many perceived natural treatments can be harmful. In general, use of CAM has been linked to a worse survival rate (HR 2.17-5.68) for lung, breast and colon cancer if not used in combination with conventional treatment.5 While AFX is not as life threatening as many internal cancers, poorer outcomes (eg, greater surgical morbidity) are more likely without surgical intervention. Understanding fears regarding conventional treatment and educating patients on their choices regarding CAM can help to lessen the risks of this decision. Asking about patient desires to pursue CAM for cancer treatment is a significant consideration. For skin cancer, it may not be as commonly discussed or considered since removal of the tumor is usually easily done with surgery. With the rise in patient interest to use treatments that are perceived as natural or less harmful than traditional treatments, deciding how this fits into a patient’s larger treatment plan may become a part of the pre-operative consultation. Above all, educating patients on the benefits, risks and harms related to any treatment they decide to pursue is critical. There are no relevant conflicts of interest. Shumay DM, Maskarinec G, Kakai H, Gotay CC. Why some cancer patients choose complementary and alternative medicine instead of conventional treatment. J Fam Pract. 2001;50(12):1067. Saltzberg F, Barron G, Fenske N. Deforming self-treatment with herbal “black salve”. Dermatol Surg. 2009;35(7):1152-4. Koch M, Freundl AJ, Agaimy A, Kiesewetter F, Kunzel J, Cicha I, et al. Atypical Fibroxanthoma - Histological Diagnosis, Immunohistochemical Markers and Concepts of Therapy. Anticancer Res. 2015;35(11):5717-35. Bagazgoitia L, Morais P, Carrillo R, Jaen P. Complete regression of an atypical fibroxanthoma. Eur J Dermatol. 2012;22(1):157-8.